In this case the bone would be a "deferred prosecution agreement" wherein the bank would get a brief reprieve from dealing with one of the 979 investigations it is currently facing. JP Morgan under siege on multiple fronts by state and federal prosecutors investigating alleged wrongdoing at the largest U.S. bank, is in talks with the Manhattan U.S. attorney to resolve allegations it helped enable the biggest Ponzi scheme. The probe by Manhattan U.S. Attorney Preet Bharara, tied to how the bank handled the funds of convicted money manager Bernard Madoff and whether it turned a blind eye to his multibillion-dollar fraud, may end in a deferred prosecution agreement, a person familiar with the matter said. Under such an agreement, the government agrees not to pursue prosecution for a limited period of time and dismiss the charges if the entity or individual improves its programs or complies with the law. It is one of several options being discussed by prosecutors and the bank, including resolving the matter with just a fine, said the person, who requested anonymity because the talks are private. 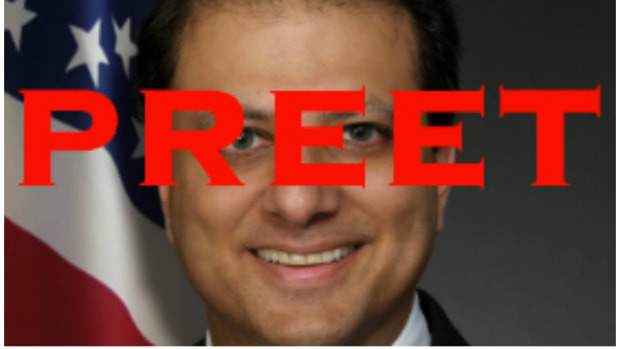 Getting fired by the president might be the best thing that ever happened to Preet Bharara.